“Wait, wait!” a man called out as he briskly walked down the hill. I stood waiting at the Land Cruiser, where he handed me a bag of chestnuts. We are often spoiled by Koreans who hand us fresh produce or, as in this case, harvested chestnuts. What a treat! We chatted hand-and-feet language for a bit and were grateful for the gift. We had run and hiked some of the nearby trails where other hikers had been quicker than we in collecting all chestnuts and we had missed out. 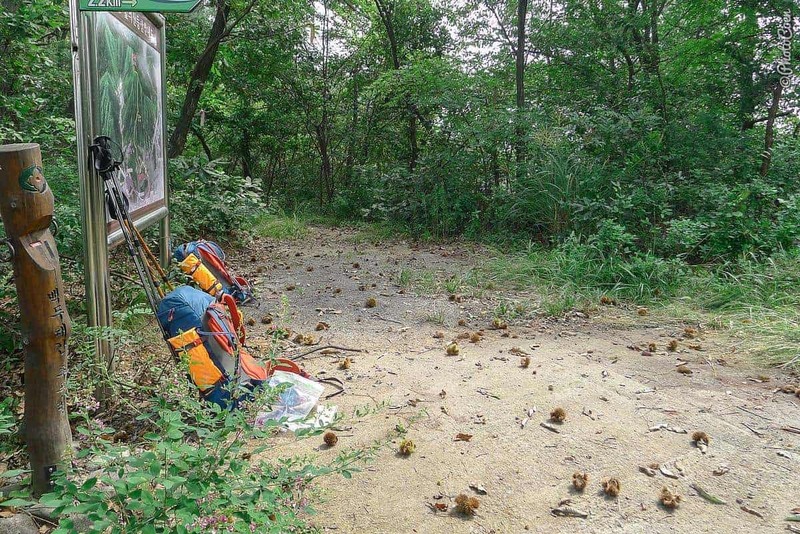 We remember chestnuts only too well from our Baekdu-daegan hike. We didn’t know you could eat them until a Korean pointed it out to us. During our hike we spent hours harvesting, cleaning and devouring them. It was such a treat – and a super nutritious one at that! 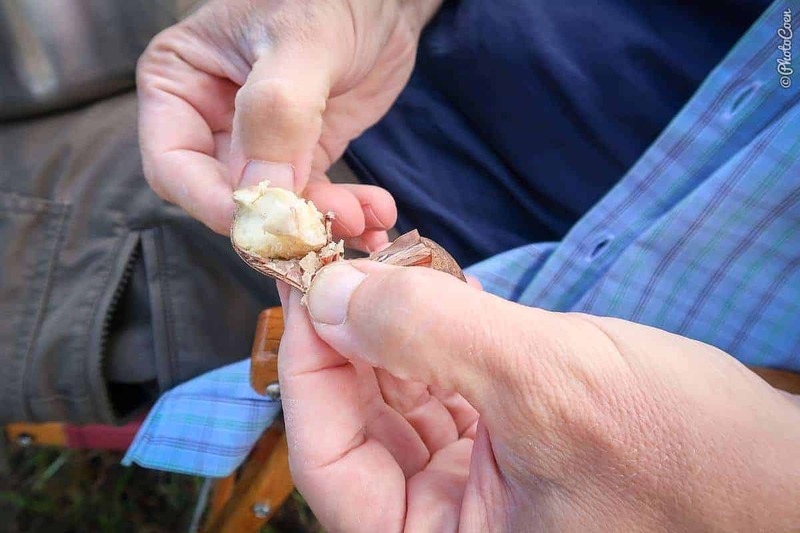 Only later we learned that cooking chestnuts in the pressure cooker worked great, too. How? Let me tell you! 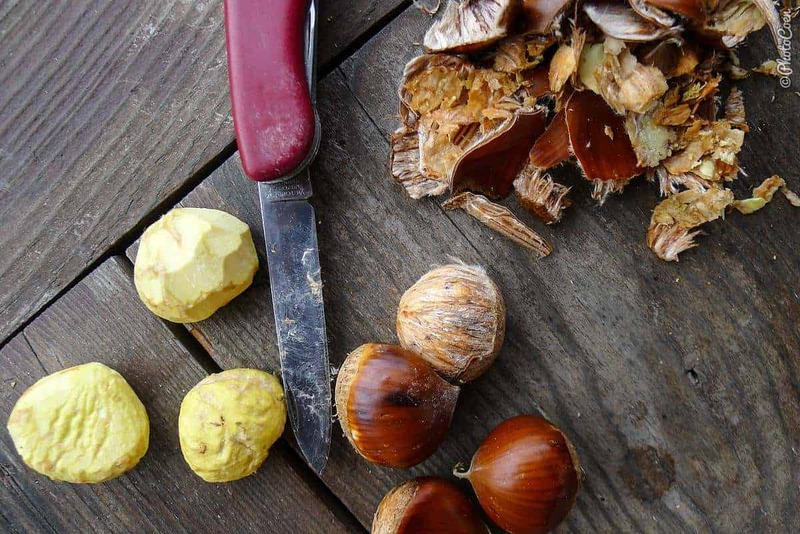 Cleaning raw chestnuts is a lot of work that requires patience as well as care to peel them with a sharp knife without cutting yourself. “There must be another way,” Coen said. I agreed – cleaning this number of chestnuts would take two days. I turned to our friend called Google. 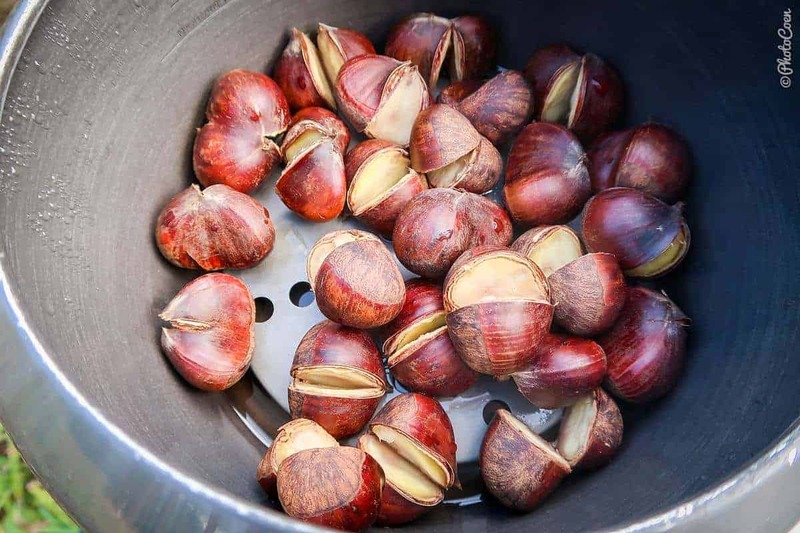 Google had answers and we found a way to cook chestnuts that indeed facilitates peeling them. However, later one we experimented a bit more and found an even better method of steaming, which requires less water and less cooking time. How awesome is that?! Thank you, pressure cooker, once more! Partly cut them with a sharp knife (otherwise they will explode). Put them under water in the pressure cooker. Close the lid, bring the pan to a boil and boil them for 8 minutes. Turn off the heat, let it sit for another 5 minutes. Take off the pressure and fish out the chestnuts. Fill the pressure cooker with 1 centimeter of water and lay the grid on the bottom. Close the lid, bring the pressure cooker to its boiling point and steam them for 5 minutes. Turn off the heat, let it sit for another 10 minutes. We then figured out that you don’t even need to peel them. Tip of the day: spoon them out, like you would do with a boiled egg! 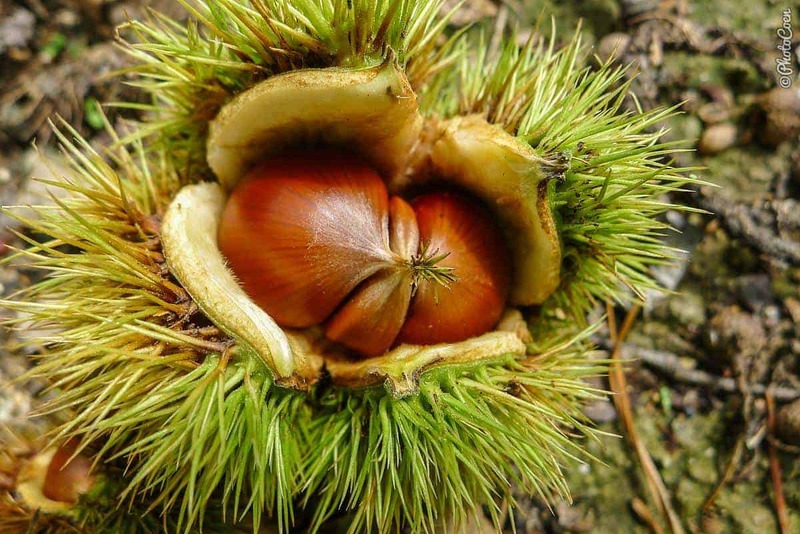 Do you enjoy chestnuts? How do you prepare them? Let us know in the comment section below! Thanks! Soak them 1 hour in cold water – cut the skin horizontally on the round bellyside with a sharp knife – put them into the oven, middle temperatur (Omnia as well / Colemann oven) with a bit water – after 20 minutes put a wet towel over the Maroni and bake for another 15-20 minutes. Try one, if it is tender it’s ok, otherwise let them bake for another moment. Make sure that the towel stays always very wet. Hi Iris, so good to hear from you.Thanks to sharing this!